Hillary Clinton Wins Over Bernie Sanders In Nevada In her quest to be the Democratic nominee for president, the Clinton badly needed the win after losing to Sanders big in New Hampshire. But Sanders is still claiming momentum. In her quest to be the Democratic nominee for president, the Clinton badly needed the win after losing to Sanders big in New Hampshire. But Sanders is still claiming momentum. There is no hangover in Las Vegas this morning for Hillary Clinton, who beat Bernie Sanders by 5 percentage points in the Nevada Democratic caucuses. NPR's Tamara Keith reports both candidates are already campaigning in the states that will vote next. HILLARY CLINTON: Some may have doubted us, but we never doubted each other. CLINTON: And this one's for you. KEITH: Clinton was supposed to be the inevitable nominee, but Sanders did better than expected in Iowa and won New Hampshire overwhelmingly. Clinton needed a win to quiet the doubters, and she got it. CLINTON: It is a campaign to break down every barrier that holds you back. KEITH: Those men and women showed up at caucus sites all over Nevada, including one at Caesars Palace casino. KEITH: There, people in housekeeping uniforms, chef's coats and cocktail dresses came straight from work. Clara Jauregui is a housekeeper at Caesars who came out to support Clinton. Her coworker Dora Montanez helped translate. CLARA JAUREGUI: Because she - (speaking Spanish). DORA MONTANEZ: She's running to go for equality between women and men, so she likes that about it (laughter). JAUREGUI: Yeah. I hope it's better. KEITH: Once the caucus got underway, it was clear Caesars Palace was Clinton country. UNIDENTIFIED MAN: After final math, Secretary Clinton gets 28 delegates. Senator Sanders gets 12 delegates. KEITH: Clinton actually won all of the caucuses held at casinos on the Las Vegas Strip, and she worked hard for those wins, making frequent stops at casino lunchrooms in recent days, even visiting workers doing laundry on an overnight shift. But Vermont senator Bernie Sanders saw a win in the results as well. BERNIE SANDERS: You know, five weeks ago, we were 25 points behind in the polls. SANDERS: And we have made some real progress. KEITH: Sanders gave his speech about an hour and a half earlier than scheduled in a fairly empty stadium in the city of Henderson. Sanders told supporters, taking on the establishment is not easy. SANDERS: We have come a very long way in nine months. It is clear to me - and I think most observers - that the wind is at our backs. We have the momentum. KEITH: And with that, Sanders was off to South Carolina, which votes next. Polls show Clinton with a significant lead in that state, driven by strong support among African-Americans. As for Clinton, she flew to Texas. KEITH: Texas is the biggest prize on March 1, Super Tuesday. Tamara Keith, NPR News, Las Vegas. 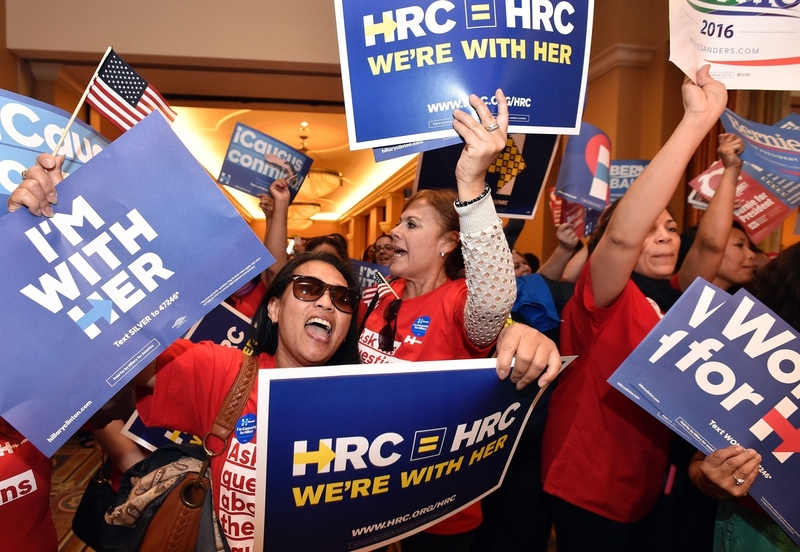 Naomi Barnes (left) shows her support for Democratic presidential candidate Hillary Clinton during the Nevada caucus in Las Vegas. Hillary Clinton will win the Nevada Democratic caucuses, the Associated Press is reporting. With 84 percent of the precincts reporting, Clinton has 52.5 percent of the vote, compared to Sen. Bernie Sanders' 47.5 percent. "Tens of thousands of men and women with kids to raise, bills to pay, and dreams that won't die — this is your campaign," she told a crowd at Caesar's Palace in Las Vegas. "And it is a campaign to break down every barrier that holds you back." This makes a second win for the former secretary of state, along with her razor-thin win in the Iowa caucuses. Sanders, meanwhile, has one win under his belt, handing a stinging 22-point defeat to Clinton in the New Hampshire primary. By those numbers, Clinton won 74 percent of the support of voters 65 and older, as well as 61 percent among people 45 to 64. Fifty-six percent of nonwhite voters also supported her. Black voters in particular helped Clinton win: 76 percent backed her. Those polls also suggest that Clinton did better among women, with 57 percent of their vote. Sanders, meanwhile, continued his dominance among young voters, with entrance polls showing him winning 72 percent of 17- to 44-year-olds. That's similar to his performance in New Hampshire and Iowa, where he likewise won young voters by big margins. And while those polls say Clinton overall got 56 percent of the nonwhite vote, those polls also suggest Sanders had a strong showing among Latinos, at 53 percent to Clinton's 45 percent, according to those polls. Latinos made up 19 percent of the electorate in Nevada. In Clark County, with 806 of 1022 precincts reporting, Clinton led by nearly 10 points — 54.9 to 45.1 percent, according to the New York Times. That's where Las Vegas is, and is where two-thirds of the vote came from in 2008. Sanders' 5-point (at this point) loss still represents a massive improvement for him in Nevada. Just a few months ago, Sanders was behind Clinton by double digits in the Silver State. Sanders referred to his gains in a statement. "I just spoke to Secretary Clinton and congratulated her on her victory here in Nevada. I am very proud of the campaign we ran," he said. "Five weeks ago we were 25 points behind, and we ended up in a very close election." The Democratic candidates now look to South Carolina, which will hold its Democratic primary on Feb. 27. Clinton maintains a strong lead there in recent polls, ahead by more than 20 points, according to RealClearPolitics. Just days later, they will compete in 11 states on Super Tuesday — March 1.